The Wandering Jews and Jim set off in heavy fog and humidity. The ride to the SAG was very urban; heavy traffic, questionable roads and lots of navigation which my group did not do well. We again added bonus miles, that is we went off route for 3-4 miles. It was a difficult day to ride quickly. We had 44 turn clues by the time we arrived at the SAG. The longest stretch without a turn was 3.5 miles. We spent a lot of time at lights and stop signs waiting for our chance to proceed. Getting lost also means we are passing some people twice. Since some are strong riders this tends to irritate them and the race is on. My fear coming to this ride was that there would be riders stronger than Jim and that he would speed up to pass them. Since I was hoping to ride with Jim, Peter and Jack this would have raised my fatigue level to an ugly level. 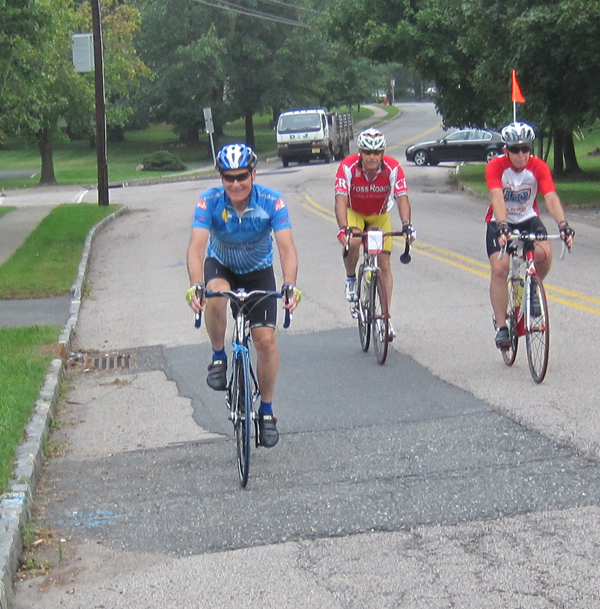 As turns out, our riding group appears to be the fastest amongst the many strong riders here. Little known fact: The New Brunswick Naval Radio Station, based in Somerset, was the principal wartime communication link between the United States and Europe in WW1. There are some truly impressive riders on this tour. This is Jan. Don't let her image fool you, I've seen her climbing large mountains. Riding buddies on the road today. Bikes outside a restaurant when we stopped for lunch. Two of the staff members, Robin and Carol. This is how we see them most of the time, resting while we pedal. I told them I was going to say that. That's why the big smiles. They work incredibly long, tough days with always a smile and we greatly appreciate it. re: little known fact - so NJ is good for something? Sent 2011-09-28 from Dave N.
Enjoying your blog. Sounds like the perfect holiday for you. Finally read all the entries! Glad that the Bike Gods are back supporting you!